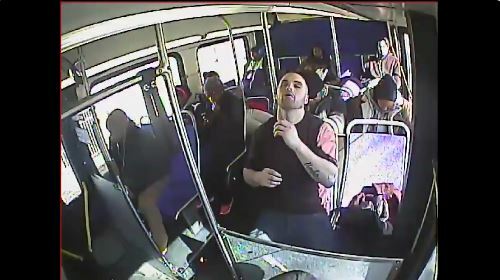 PHILADELPHIA - Police outside Philadelphia released video Tuesday showing a man overdosing on heroin on a crowded transit bus and being revived by police officers carrying a lifesaving drug. Michael Meeney, 25, of Middletown Township, was arrested early Tuesday, almost five days after he was treated with Narcan on the Southeastern Pennsylvania Transportation Authority bus, said Upper Darby Police Superintendent Michael Chitwood. Overdose antidote saving lives, use expanding across the U.S. The department posted edited video of the overdose and revival on its Facebook page. Chitwood said it was to show how the heroin scourge is affecting communities. "Normally you see overdoses in a bathroom or vacant building, but this was at 1 p.m. on a public bus," he said. In the video, Meeney is seen shooting heroin into his right arm, looking dazed and then collapsing into the aisle. The footage, recorded Thursday, cuts to the bus empty of passengers and officers administering the Narcan spray. It then shows officers escorting him off the bus as some of the 40 passengers applaud from the sidewalk. Meeney was treated at a hospital and released. "It's a great thing that that Narcan saves lives but it doesn't do anything for the addiction," Chitwood said. Meeney was arrested at 1 a.m. Tuesday and jailed after packets found in his belongings tested positive for heroin. "At least he is in the system and he can get treatment in the system," Chitwood said. Online court documents don't list a lawyer for Meeney, who has a number of prior arrests, mostly for petty drug charges.